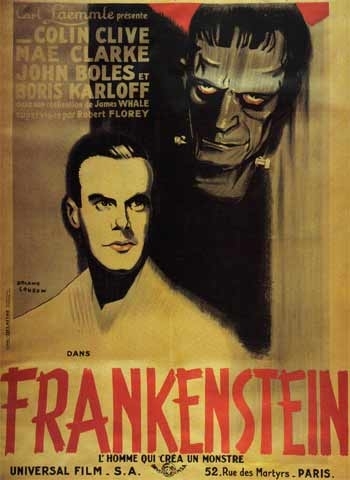 A French poster for the original horror classic, FRANKENSTEIN (1931). Get it on Blu-Ray, DVD or various poster reproductions here! Creepy Classics has what you want - Blu-Rays, DVDs, VHS, Monster Magazines, Posters, T-Shirts, Monster Models and more. 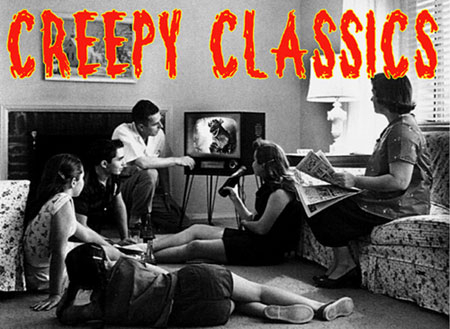 Did you grow up watching classic monster movies on TV? Reading monster magazines? Welcome home. Welcome to Classic Horror, Science Fiction and Mystery movie collectibles! Hard-to-find, rare horrors and "Creepy Classics" on Blu-Ray, DVD and VHS video! PLUS, Famous Monsters Magazines, Books, Tee Shirts, Posters, Collectibles and information on MONSTER BASH - The International Classic Monster Movie Conference. Your shopping cart will be active until you leave the store. See our News Department for all the latest release information and new products at Creepy Classics. Order on-line here at Creepy Classics! On-line ordering for almost every country. You can also mail in a check or money order to: Creepy Classics, P.O. Box 23, Ligonier, PA 15658. Shipping and handling for any size order (no matter how big!) is only 7.50 for shipping in the USA. Even if you order 100 items, it remains at the flat rate. Other countries, please e-mail for S&H rate. Allow 1-2 weeks delivery. Or, call in your order with credit card at (724) 238-4317. The Creepy Classics and Monster Bash News Page is here! Join in the conversation on various topics here too. Be part of one of the web's most popular blogs about classic monster movies. Find out the titles of misty movies you remember from your childhood. Discuss what you've watched lately and keep up-to-date on the Monster Bash Classic Movie Conference. All Blu-Rays and DVDs at Creepy Classics are NTSC standard USA format, unless otherwise noted.